my Scarf Along guinea pigs. I have never had all of my fabric in the same place. can you say a bit much? Stacks and stacks of happiness. yesterday and plan on continuing to by water this season. Mel shared with me two videos from The Advent Conspiracy that really checked my heart and solidified how I am going to look at this consumer driven Christmas in a whole new way. I dare you to watch them. I know the winner of their own batch of custom cards. Mel has generously decided to buy $10 worth of water for each card she designs. Why don't you save lives while you get AMAZING cards made? Your heart is so generous. I am soooo jealous!! Look at all that yummy fabric - can I join your class?! I heart Mel - what an awesome thing for her to do! Ooh! So pretty! 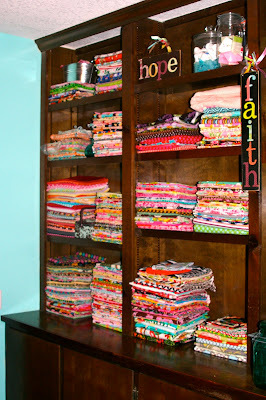 I'm definitely envious of your fabric collection (there's no such thing as too much fabric!). i might be mad about this room. Awesome!! I have way to much fabric too...but it comes in so handy when I need some for a project and I don't have to leave the house to go buy it. Very nice room! I'd love to have that! Good job! My kitties would love to come over and play in all that fabric. They'd have it strewn all over the floor into a big pile in no time. Then they'd curl up and take a nice long cozy nap on top of it all. While they shed profusely. Especially the long-haired black kitty. Because that's what Jemima panther princesses do. I guess it's a good thing I don't have a nice big craft room with built-in shelving and am forced to store all my fabric in plastic Rubbermaid bins stacked up precariously all over my dining room and living room. And entryway. And bedroom. Yup. I'M the lucky one. You only thought it was you. And guess who has an email link on their profile now? Yup. The girl without a craft room! I think your next adventure needs to be live web casting sewing classes! oh.my.goodness! totally drooling over all that fabric! Umm, next month are we allowed to help ourselves to that stash? Wow~ Your fabric looks so delicious! I'd like to go to your house and just rub my face in it. Lucky you - my dewing room is my dining room table. I am happy that if I can't have a great craft room at least someone else can. Happy Creating. My niece and I are very excited to get rolling on our scarf along!! Your room is beautiful, love the paint color of the room.....sew fun..haha!! That craft room is TDF!!! Congrats! I bought some water too. I have a little etsy shop and hope to be able to buy more with each sale!! Oh Julie...I am so excited for you! Your craft room looks fabulous. I wish I could come to your sewing class too. How fun! I need to see more of your craft room. I about died when I saw the stacks of beautiful fabric. My small stack of yummy fabric is stored in a bag. I have no place for it. sad. Wish I lived in california so I could come to your sewing class!! WOW that looks fabulous! My dream is to actually have built in shelves so my fabric can ALL be in the same place!! Or perhaps my own actual sewing room instead of having to share it with the kids toy room!! ps Am I supposed to email you about the cards? I love your shelving! Your fabric and goodies look so yummy! You make me want to re-fold all my fabric and redo my office! :) Do you have a big table for your sewing classes? Such a great idea. Thanks for sharing your space! Coming out of lurkdom to say that this is the first time in over 5 years that I wished I still lived in the OC... so I could come to your sewing class. I love your stacks of fabric and I'm sure the class will be super fun! Thank you for posting the link to Mel's page with the videos. A few years ago my family went to drawing one name and giving the rest of the money we would spend on eachother to those who really need it. It has been the best thing! We really can make a difference in the world!